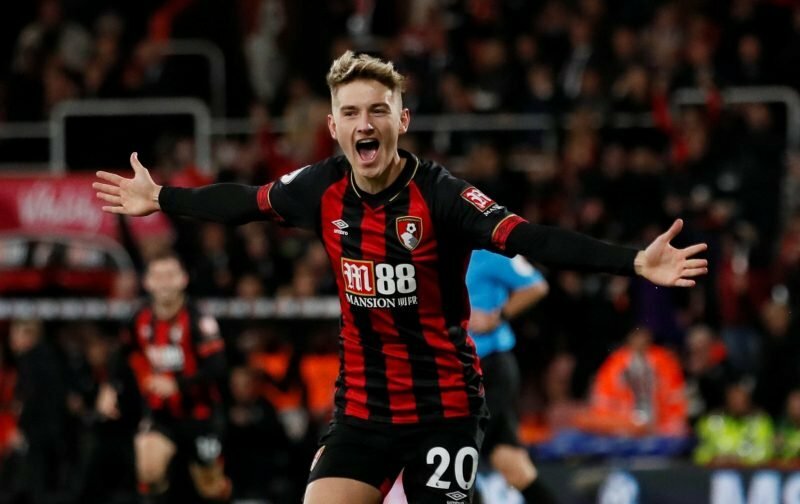 A coming of age home performance by Bournemouth’s Welsh prodigy David Brooks ended a tricky run for the Cherries and brought a much needed three points. Brighton are notoriously stubborn and it normally takes an exceptional talent to unlock them.Brooks provided that today with two very different but equally sublime finishes. Eddie pulled off his ‘normal surprise’ with Franno returning at right back. Brooks came in for Ibe as the side switched back to 4-4-2 and Wilson was back up top with King with Fraser stepping back to the bench. The start was ‘understandably nervy’ as Eddie described it with Bournemouth, Stanislas and King in particular, too easily giving up possession. Brighton are certainly no world beaters away from home but they comfortably gained possession and looked very dangerous. The plaudits rightly go to Brooks but it should be remembered that Begovic earned his teammates the platform to go on and win this match. He set the tone early flying across goal to deny Bassouma after a sharp move cut us apart. Bournemouth were playing very much on the break and King had a curling effort cleared off the line but that and some dangerous crosses from Francis was the only intent shown. Once again it was Begovic to the rescue saving brilliantly at full stretch to deny Locadia. It was scrappy stuff but a moment of brilliance in the 21st minute lit up the game. When King found BROOKS drifting into midfield there was much to do but the mercurial Welshman set off on a run twice feinting to shoot to earn space and take three opponents out the picture…just as you thought he had gone one too far he smashed a left-foot drive across Ryan into the bottom corner. Back came Brighton and after Lerma took one of his special bookings (to top the Premier League yellow table) Begovic saved his best for the last of the half going full length to brilliantly keep out Dunk’s header. The second half was much better for Bournemouth in terms of possession but low in chances for either side. Bournemouth gained many set pieces but the corners were laughable in terms of execution with Stanislas the main culprit. He did however nearly atone with a booming free kick that whistled millimetres past the post with Ryan rooted. Brighton were very unadventurous but Bournemouth were lacking verve and drive but all that changed when Eddie turned to Ryan Fraser.. finally instead of two wingers drifting in we had someone willing to run at the byline and cause havoc. This stretch really put the Seagulls on the back foot and extra help was received when Dunk brought down Wilson for a second yellow (I couldn’t remember the first but assume it was bad). With the visitors down to ten, a goal to finish them was necessary and unsurprisingly assist king Fraser was at the heart of it cleverly crossing a lovely dink. There didn’t seem much on as it came to BROOKS with his back to goal but he improvised brilliantly to flick the ball with his head over Ryan into the net. Bournemouth pressed for a third with some great football but it wasn’t forthcoming…although the three welcome points were! Begovic 8 – an outstanding first half that earned the points. Francis 8 – superb return defensively and on the ball. Cook 7 – commanding display against former paymasters. Stanislas 5 – another poor game. Wasteful in open play and set play. Lerma 6 – sloppy start but recovered with some good passing. Surman 7 – another calm display of measured passing. Brooks 9 – lit the game up with class and finishing. King 5 – a bit off colour…not getting past people anymore. Wilson 6 – worked hard and good hold up else quiet. Like Huddersfield, this was a ‘result more important than performance’ game. To be fair it was also a better performance than Huddersfield. Eddie normally reverts to 4-4-2 when on a bad run and everyone knows their jobs as it is riven in the clubs DNA. It grew as a performance throughout the game and it allows a bit of breathing before the tricky festive period. Another 4 wins would assure safety which is key. Eddie will be aiming higher than this of course and much will depend on him getting all eleven players firing at the same time. Today he had King and Stan off form, why the latter started ahead of Ibe and Fraser following their midweek performances and Stans own dismal last three games is a mystery. The defence were excellent…Franno has his critics (strangely in my book) but was outstanding today and we missed him at Wolves. Begovic also answered Boruc call to arms from his midweek game. Good squad motivation. Special mention as well for Surman also maligned at times but very calm today. That just leaves Brooks. A special talent who will get better and better with Howe’s tutelage. He has the ability to unlock defences and looks like he will develop into a great finisher. That number ten role looks written in stone once his manager works out the system! Still, great points total…we can enjoy the festive period…form looks like it is back. Much festive cheer! Happy Christmas everyone! 26 pts – Happy Christmas! – Join the conversation, click here.